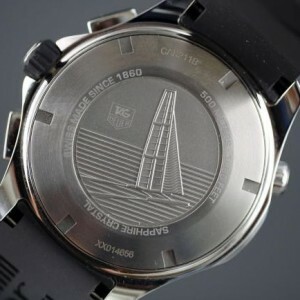 The brand TAG Heuer starts in 1984 with the taking over of Heuer by Techniques d’Avant Garde. 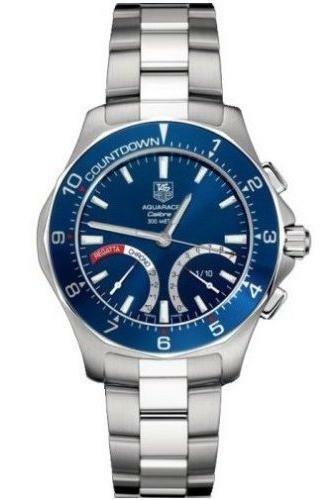 Very early on the new TAG Heuer management decided to continue to promote TAG Heuer as a sports watch. There was a lot of effort focussed on supporting sailing teams and events. The first of the TAG Heuer sailing watches was the Searacer series (with quartz movement), a watch that TAG Heuer released as both a variant of the 2000 Series and the S/el- Link Series. It was worn by Chris Dickson, skipper of the Dennis Conner’s Team’s ‘Toshiba’ in the Whitbread Round The World Race 1997-1998. The first generation Searacer watches were available with either a brushed and polished stainless steel bracelet with double-safety clasp (reference CK111R.BA0328), or with a calfskin leather strap with signed buckle (reference CK111R.FC8117). Both versions were delivered with an extra nylon strap, enabling the watch to be worn over a wetsuit. 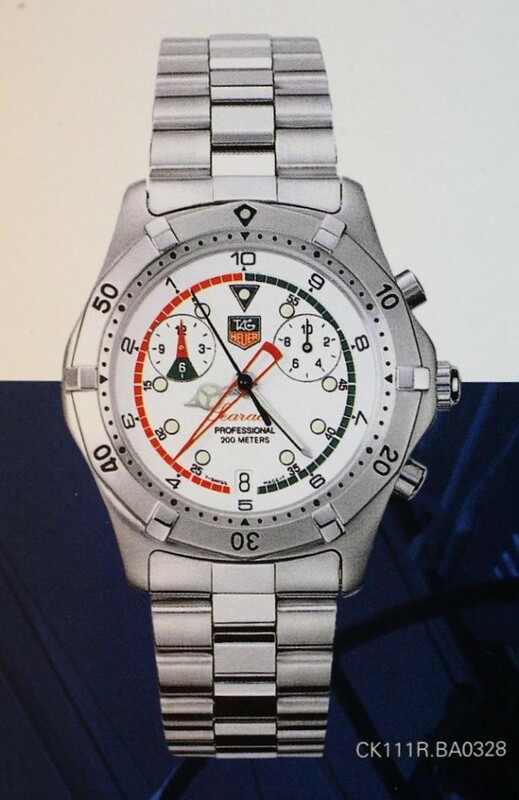 Model: TAG Heuer Searacer Regatta Chronograph. Reference: CK111R.BA0328 with steel case and steel bracelet. CK111R.FC8117 with steel case and black leather strap. 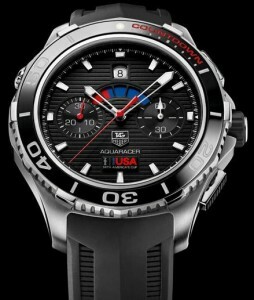 Caliber: TAG Heuer quartz yachting movement. 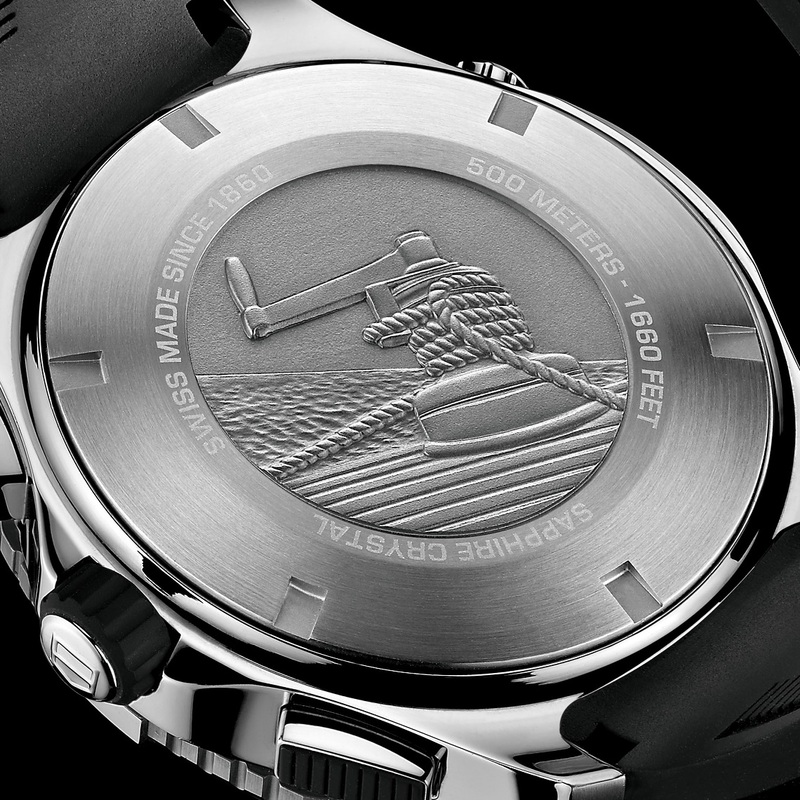 The distinctive feature of the Searacer is the Regatta function, with its inner-bezel numbered from 1-10. It has a black central sweeping seconds hand for the chronograph functions and two sub-dials. The left sub-dial is a 12 hour counter while the right sub-dial shows 1/10th second for the chronograph. The central red hand counts the Regatta minutes. Besides as a normal chronograph, the TAG Heuer Searacer Regatta Chronograph also functions as a countdown timer for yacht racing. By depressing and holding the bottom chronograph pusher the chronograph is put into “Countdown” mode. This will be indicated by the red left register hand pointing in the downward position. The left register does not have a timing function in this mode and only acts as a countdown mode indicator. Once the countdown mode is activated, pressing the top chronograph pusher at 2 o’clock begins the countdown timing. The center black chronograph hand will count seconds. The large red chronograph hand will advance every 10 seconds and by using the outer dial chapter the red hand will count down for 10 minutes. Once the 10 minute countdown has completed, the chronograph will automatically switch back to standard chronograph timing mode and the left register will point up. The second generation Searacer was based on the S/el- Link case and again came in two versions, one branded S/el and a later series branded Link. Apart from the obvious difference, there are also small details changed between the two second-generation Searacer models, for example the S/el Searacer has an applied TAG Heuer logo in silver, while the Link models have the logo printed on the dial. TAG Heuer Link Searacer with black, blue and white dial. 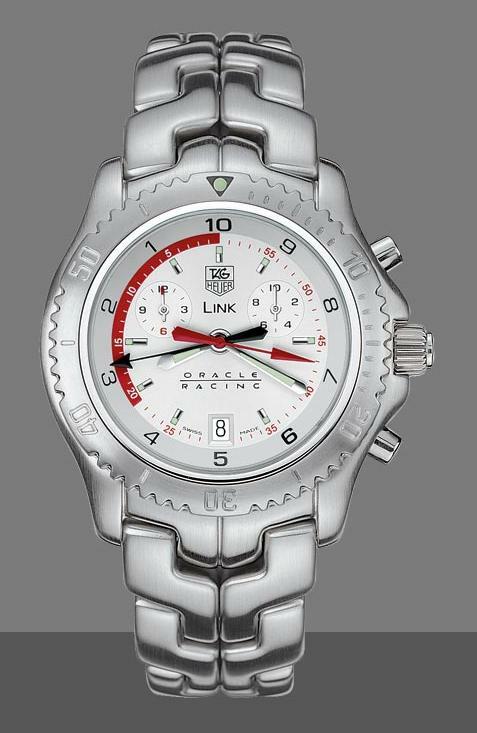 Model: TAG Heuer Link Searacer. Reference: CT1113.BA0550 with black dial. CT1114.BA0551 with silver coloured dial. CT1118 Oracle Racing limited edition of 1500 pieces, 2002. Caliber: Quartz ETA 251.232/262 movement. In 2005, TAG Heuer introduces the new Aquaracer Calibre S Regatta , the world’s easiest-to-read and easiest-to-use electro-mechanic chronograph. To commemorate the launch, TAG Heuer signed a long-term agreement with China Team, the People’s Republic of China first ever America’s Cup sailing team. Aquaracer Calibre S Regatta in blue and anthracite, and the 2006 China Team Special Edition. 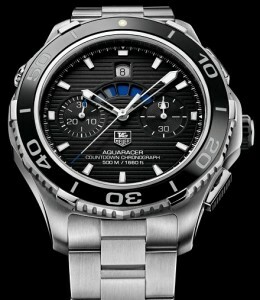 Model: TAG Heuer Aquaracer Calibre S Regatta. Reference: CAF7110.BA0803 with blue dial and bezel, and steel bracelet. CAF7110.FT8010 with blue dial and bezel, and black rubber strap. CAF7111.BA0803 with anthracite dial and bezel, and steel bracelet. CAF7111.FT8010 with anthracite dial and bezel, and black rubber strap. CAF7112.BA0803 China Team limited edition of 2000 pieces, 2006. 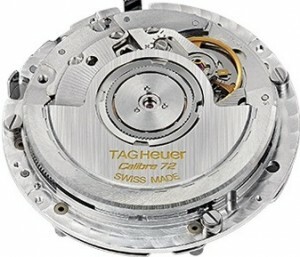 Caliber: patented TAG Heuer Calibre S electro-mechanical movement. Year: 2005/2007. In 2009 no longer in the catalogue. But in 2010 still at their website. 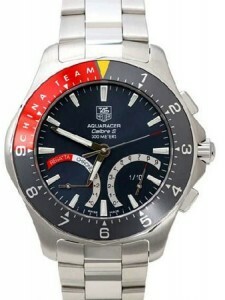 You can download the instruction manual for the Aquaracer Calibre S Regatta here. 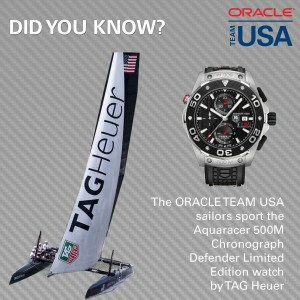 In November 2011 TAG Heuer announces the renewal of the partnership with Oracle Racing, the team that will defend the America’s Cup in 2013 in San Francisco Bay. To mark this partnership, TAG Heuer released a special edition of the Aquaracer 500m Chronograph with the only visible change being the small ‘Oracle Team USA’ added beneath the date window. And by the end of 2012 the Aquaracer 500m Calibre 72 countdown chronograph is introduced, as the first model in the 500m ceramic chronograph series. The watch has a ceramic bezel upon a steel case, and marks the return of the 5-minutes regatta visual timer. It becomes available in two versions, a standard one and a Limited Edition ‘Oracle Team USA’. TAG Heuer Aquaracer 500m Calibre 72 countdown chronograph. 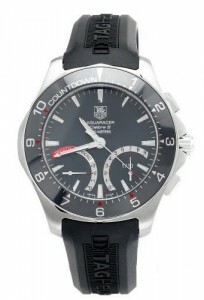 Model: TAG-Heuer Aquaracer 500m Calibre 72 countdown chronograph. 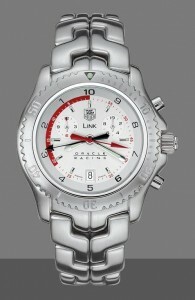 Reference: CAK211A.BA0833 with steel bracelet. CAK211B.BA0833 Limited edition for Oracle Team USA with steel bracelet. CAK211B.FT8019 Limited edition for Oracle Team USA with rubber strap. Caliber: TAG Heuer self-winding automatic Calibre 72. 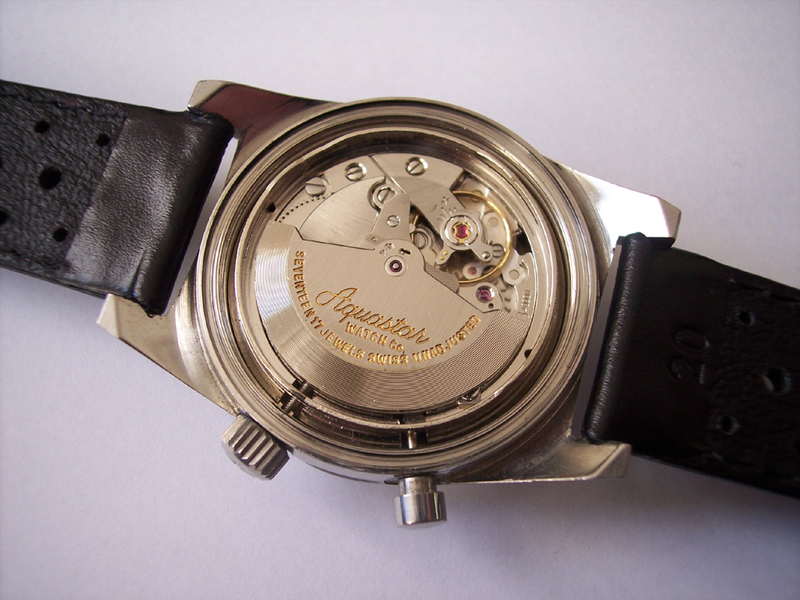 Case size: Ø 43 mm. Caseback for the standard version and the Limited edition for Oracle Team USA. Size: 13ʺ / 30 mm. Base caliber is a Sellita SW-300 chronograph, with a Dubois-Depraz 2140 regatta module integrated.